Why not spruce up your dog's style with one of our lovely dog bandanas. 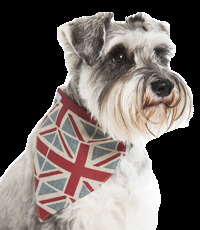 They come in a selection of fabrics including the classic Emily Bond Labrador Stripes, Red Dachshund and the very patriotic Union Jack print. Most of our bandanas for dogs are fastened with Velcro which allows for easy size adjustments for that perfect, comfortable fit. These dog scarves also make the perfect gift for any dog. Your dog will definitely turn heads in the park wearing one of these fabulous dog neckerchiefs! The latest trend in doggy fashion are these wonderful dog bandanas. Each handmade here in the UK, our scarves for dogs are chic and stylish. Some of our dog bandanas can be personalised with your dogs name. Top designer brands Mutts and Hounds, Arton & Co and Pet Pooch Boutique have chosen a fabulous range of fabrics to make these lovely neckerchiefs for dogs. Suitable for all breeds, we are sure you’ll find the perfect scarf for your dog in our collection. Your dog’s drawer isn’t complete until you have a dog bandana in it.